Start your own online radio station with SAM Broadcaster Cloud – Go from zero to pro in 10 minutes! – Automation scheduling: SAM Broadcaster Cloud is keeping your station running 24/7 even if you are not around to operate it. No servers or staff necessary! It’s the easiest way to create a radio station. – Cloud/No hardware issue: Broadcast from anywhere using just a computer with Internet access! – Live source switching: Stream live shows using SAM Broadcaster Live DJ. – Manage multiple radio stations easily from one single music database. Give permission access to your station managers and DJs. – Music Library: up to 50GB of storage (or even more) in the Cloud to organize large music libraries quickly into multiple categories. – Web Integration: easily embed your radio station player or included web widgets on your website. 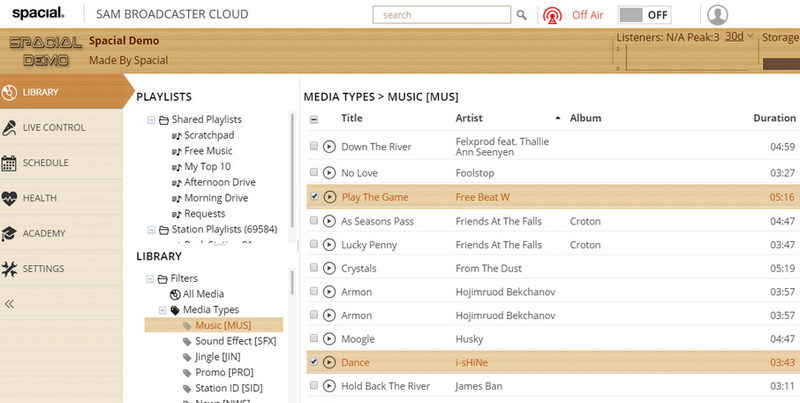 – Streaming: every SAM Broadcaster Cloud station comes with 40 listener slots. No complex encoder to setup, no need for IP address, port number and whatever complex configuration. Also compatible with Shoutcast v1 and Icecast v2 streaming servers. – SAM Broadcaster failback option.